[News Focus] Is China opening doors to Korean battery makers? Mixed expectations emerged Friday over the fate of Korean battery makers in China as the neighboring country granted approval for SK Innovation to develop batteries for Mercedes-Benz cars in the country, lifting its two-year ban. 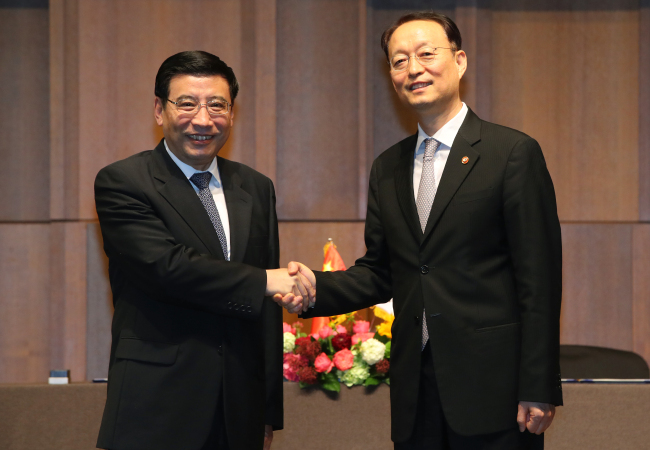 The South Korean commerce minister expressed optimism, saying that the case signals a new beginning. “The use of SK Innovation’s batteries was formally approved Tuesday and it is seen as an apparent signal by China (to Korean companies),” Paik Un-gyu, minister of trade, industry and energy, told reporters on Thursday evening after meeting with Miao Wei, China’s minister of industry and information technology, in Seoul. The formal approval does not necessarily mean the Chinese government will provide subsidies. But it is a step that a company must take to apply for government subsidies for electric cars. Korean battery firms have not received both formal approval and subsidies in China over the last two years due partly to the national drive to foster the local battery industry and Beijing’s retaliation against Korea’s deployment of a missile defense system. This month, the Chinese government also included three Korean battery makers, Samsung SDI, LG Chem and SK Innovation, in its “White List,” a list of model companies that have a high possibility of receiving subsidies from the Chinese government in the future. “Wei said the (Chinese) market will continue to open and the outcome will change based on the marketing efforts of Korean battery makers,” Paik told reporters after the meeting. Still, industry insiders remain cautious, saying it is too early to be optimistic with one case approved. “The approval of one car -- not directly leading to subsidies at that -- and the inclusion on the White List should not be overstated. We need to see developments in the coming months -- whether the recent move really is a green light,” said an official from one of the three battery makers on the condition of anonymity due to the sensitivity of the issue. Samsung SDI and LG Chem, once dominant battery players in China, are now facing setbacks in the nation after repeatedly being left out from the Chinese government’s subsidies. In China, it is almost impossible to sell electric cars without financial support because subsidies account for around half of electric car prices. The operation rate of the Korean firms’ plants dropped as low as 10 percent despite trillions of won invested. Some industry watchers say Korean companies should develop their own strengths, separate from subsidies, because the Chinese government is slated to end its subsidies on electric cars from 2020.